The UN says no progress was made in the latest meeting on Syria’s crisis between Russia, Turkey, and Iran. The three powers gathered on Thursday in the 11th round of discussions in Astana, Kazakhstan. But the office of UN envoy Staffan de Mistura said no steps were taken towards the establishment of a Constitutional committee. 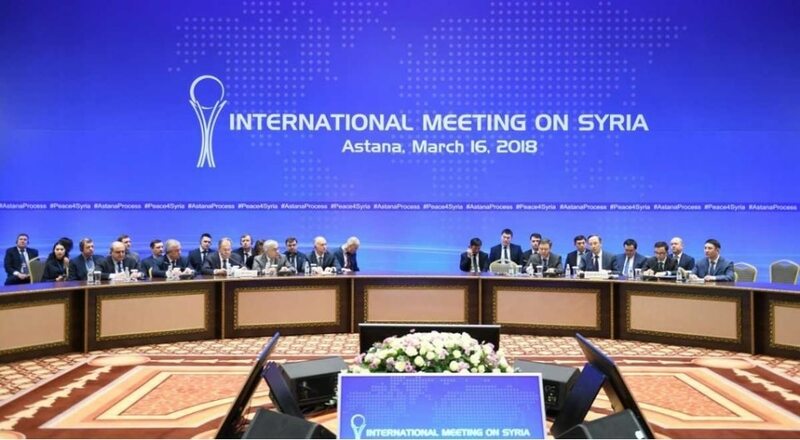 The Assad regime, propped up by Russia and Iran, has objected to any signficant role on the committee for Syrian opposition groups, who are backed by Turkey. The regime is also holding out against any transition which involves Bashar al-Assad stepping down from power. Special Envoy de Mistura deeply regrets…there was no tangible progress in overcoming the 10-month stalemate on the composition of the constitutional committee. This…has, sadly for the Syrian people, been a missed opportunity to accelerate the establishment of a credible, balanced and inclusive, Syrian-owned, Syrian-led, UN-facilitated constitutional committee. The three countries said in a joint statement that they will “intensify” consultations to establish the committee as soon as possible. Russia’s representative Alexander Lavrentiev insisted the outcome was “positive”. The statement also expressed concern with violations of a demilitarized zone around opposition-held territory in northwest Syria. Russia and Turkey declared the zone, 15 to 20-km wide and 100-km long around Idlib and northern Hama Province, on September 17. The agreement suspended a Russian-regime offensive to overrun the last major opposition area in Syria. The Assad regime continues to insist that it will regain “every inch” of the country. Pro-Assad forces have shelled the periphery of the zone, causing scores of casualties, with rebels engaging in retaliatory attacks. On Thursday, Russia, Turkey, and Iran said they “would step up their efforts to ensure observance” of the zone while emphasizing the need to continue to “fight against terrorism”. The UN’s humanitarian adviser Jan Egeland said Russia and Turkey need to negotiate with rebels and with the jihadist bloc Hay’at Tahrir al-Sham, to protect an estimated three million people in the opposition territory and to foster a peace process. “Many are very nasty types but it would be tremendous a mistake to give them no option but to fight to the last man and the last civilian in the areas they control,” Egeland said.